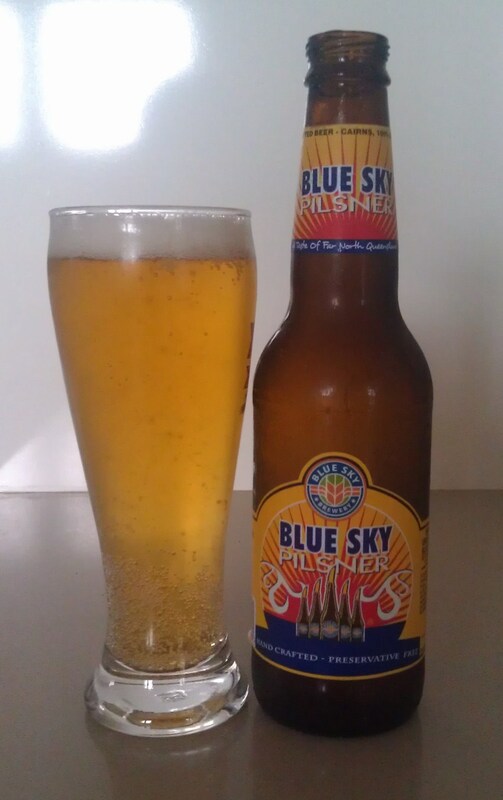 And so we come to the very final Sunday Sesh for this summer, brought to you by Blue Sky Pilsner. This is the same little brewery in Cairns that produces of one of my new favourites from this summer, FNQ lager. This is a Czec-style pilsner, so it’s a clear, pale-yellow beer with lots of carbonation. It smells sweet and florally out of the bottle, and pours well, with a small head that sticks around as you drink it. This one’s a bit spicy, and leaves your tongue feeling tingly. It’s refreshing and very easy to drink. The sweetness in it reminds me of drinking shandies when I was younger, but it’s got a bit of a bite that leaves you feeling the bitterness in the bottom of your throat. This is on the heavy end of mid-strength brews, and would make a great session beer. Great to share with mates over a BBQ. Another success from the north of sunny Queensland. Dare I say it – I think we do make some of the best brews Down Under up here. So what’s next for the blog if this is the last Sunday Sesh? Firstly, I’ll be getting my head stuck back into some writing, which I’ve been neglecting over the last few weeks. I intend on starting the Sunday Sesh’s back up again with the onset of summer next year, which means 13 Sesh’s instead of the 26 like this year. Summer got the hint this year and gave me some fantastically hot, steamy and sunny days, so I think I can forgo drinking through spring this time around. In the mean time though, I’ll be charting more of my writing journey on here, and occasionally throwing in some posts on things that amuse me, just for fun. The posting schedule is going out the window for the time being, so I’ll really be posting when I have something to say. I’m hoping that will turn out to be at least once a month, but since I can talk under water with a gag on, it’s probably going to be more often. We’ll just have to wait and see. So that’s it from me for the Sunday Sesh’s. I hope you’ve enjoyed the beer reviews as much as I have. It’s a little disappointing to be getting rid of my best reason to drink beer, but I don’t think Wifey will be complaining. As always though, I’m always on the lookout for good brews, so if you have any suggestions for something to add to my list for next summer’s reviews, let me know.